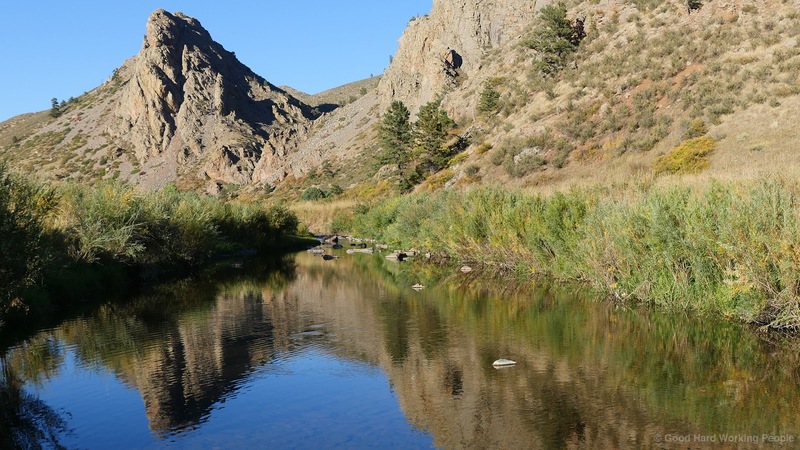 Eagle's Nest Open Space features 755 acres of nature, about 5 miles of trails, access to the North Fork of the Cache la Poudre River and beautiful views of Eagle's Nest Mountain and the Laramie Foothills. The best part about Eagle's Nest Open Space: not many people seem to know about it. Eagle's Nest is just outside Livermore, Colorado, about half an hour north-west of Fort Collins via 287. For locals: the entrance is on the left side just after you turn at Forks towards Red Feather Lakes. From February 1 to July 15 certain areas as are closed to protect nesting animals. And yes, there are Golden Eagles nesting on Eagle's Nest. I didn't get any footage, but I did photograph a raptor. Haven't identified yet which bird it is though. Larimer County Open Spaces are free to enter and are financed through a 1/4 cent sales and use tax. Some of the land is used in cooperation with farmers - so don't be surprised if you run into a herd of cows. Started as a citizens initiative, these lands serve both as a protection of natural resources and as places of recreation. The reason why I think this a well-kept-secret is because when we were there on a beautiful, sunny, warm Sunday afternoon, we only ran into one small group on horseback and one other guy when we first got there - and then didn't see another human being for the rest of the afternoon. A quick note on the video: When we first got out of the car it was so crazy windy that there was no way I would be able to shoot a decent video, even with a tripod. So I left the tripod behind. Once we had walked a bit and got down into the valley, the views were so breath-taking and the wind had died down some. So I ended up getting footage without the tripod. Tried my best to smooth it out in post. By the way, I'm still struggling a little bit with color correction of the 4k footage in Adobe Premiere. I'm interested in your feedback regarding color, contrast and brightness. The song in this video is the instrumental version of the song "Midnight Sun" by Josh Woodward. This song is licensed under a Creative Commons Attribution 4.0 International License. Thank you so much, Josh! In the next few days, I'll upload a few photos to the In A Colorado Minute 2016 Flickr album and my blog.